Started in 2011, Ahrefs’ index is updated with fresh backlinks every 15 minutes and the crawler processes up to 6 billion pages a day. 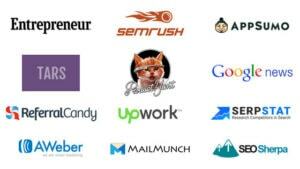 Lots of marketing and SEO pundits trust Ahrefs as their go-to backlink analysis tool. This is because of its index size and the accuracy with which it presents the data. In the recent past, however, the team behind Ahrefs has worked diligently to introduce new features and also innovate the existing ones. One example of this is the powerful Keywords Explorer 2.0. So in this Ahrefs review, we’ll not just examine the tool’s backlink analysis capabilities, but also explore its various SEO and content marketing features, and evaluate other factors such as pricing, customer support, ease of use, and overall online sentiment around the product. All good things come at a price. Ahrefs is no exception. The prices start from $99/month or $82/month if you choose to pay annually. If you’d like to use Ahrefs to manage just one blog, then the Lite plan should be sufficient for your needs. If you’re running multiple blogs, then the limitations of the Lite plan may hold you back. In that case, upgrade to the Standard plan which allows you to track more keywords and backlinks. And if you run multiple websites or manage clients’ websites at your agency, then you’ll need to upgrade to Advanced or Agency plan depending on your requirements. Ahrefs has built a reputation over the past few years as a reliable backlink analysis and competitor research tool. But in the recent past, Ahrefs has launched new features and revamped existing ones to be a full-fledged SEO and content marketing tool. So let’s explore all these features in detail, starting with the Ahrefs dashboard. Once you login to your Ahrefs account, you’ll be prompted to create a new project and add your domain. Next, you’ll be asked to enter the keywords, locations, and the competitor websites you’d like Ahrefs to track. You can enter up to 5 competitor websites. Ahrefs makes this task easier by crawling your website and suggesting the right keywords and competitors for your website. Next, you’ll be taken to Ahrefs’ dashboard which presents you with all the vital stats of your site, including Ahrefs rank, domain rating, backlinks, referring domains, organic keywords, and the progress of your tracked keywords in search engines. Site Explorer gives you an in-depth look at the organic search traffic and backlink profile of any website or URL. A large portion of your time on Ahrefs will be spent on Site Explorer. You can either generate data on your own site or your competitors’ sites via Site Explorer. Click on Site Explorer and type any URL into the search box. Ahrefs will give you an overview of the site. From here, you can view a website’s total number of backlinks, organic keywords, organic traffic for those keywords, paid keywords, and also see important SEO metrics such as URL rating, domain ratings, and Ahrefs rank. Site Explorer is a great way to start using Ahrefs as it presents a quick analysis of your site. To unleash the true potential of Site Explorer, however, you’ll need to use other features discussed here below. This is where the fun begins. From Site Explorer, you can access a report that lists all the sites linking to your target website or URL. You can filter down this data by Link Type (DoFollow, NoFollow, Redirect, etc. ), Platforms (Blogs, Wiki, Comment Systems, etc.) and Languages. You can view the new/lost/broken backlinks and referring domains of a site, view all its anchors, and top referring content (most popular content of your target website based on number of social shares). Ahrefs provides you with an option to export all this data onto a CSV or PDF file. New Keywords – A report that shows if a keyword moved to a higher “group” since last week. There are 3 “groups”: rank 1­-3, rank 4­-10, rank 11-­50. Movements – A report that shows the history of all ranking movements that Ahrefs’ bots have noticed for a target website or URL. Top Pages – A report that ranks the pages of a target website based on how much organic search traffic they bring. Ahrefs allows you to view the pages of a target website based on their total number of backlinks. In this section, you’ll be able view a site’s best pages by number of backlinks, best pages by links’ growth, best pages by total number of social shares, and top content by total number of shares. Ahrefs is a reliable PPC tool as well as it displays paid search insights which can really help you plan your PPC ads. This section of Site Explorer helps you unveil your competitors’ paid search keywords and ad copies. You’ll be able to view all the keywords that a site ranks for in paid search results. You can also view a preview of the ads as seen in paid search results and finally, you’ll be able to see the top landing pages that receive the most paid search traffic. All this data can be exported onto a CSV file. The Rank Tracker feature on Ahrefs helps you keep track of a list of target keywords. Remember the keywords you entered while creating a new project on Ahrefs? This is where you can track the progress of those keywords in SERPs. In addition to this, you can also see how your rankings for a particular keyword progress over time through position history charts. In addition to these, Ahrefs also allows you to track your rankings in multiple locations (country level) both for desktop and mobile devices. You can also enable Rank Tracker Notification which will allow Ahrefs to send you a weekly or monthly report of your rankings via email. Click on ‘Notification Settings’ to enable Rank Tracker Notification. Rank Tracker Notification is particularly useful if you manage a lot of sites or offer SEO services. Spammy links pointing to your site can really affect your search rankings. As such, you should monitor your backlink profile on a regular basis to identify any suspicious links to your site and disavow them from time to time. Ahrefs makes this task easier by giving you an option to add links to your disavow list while browsing Site Explorer reports. 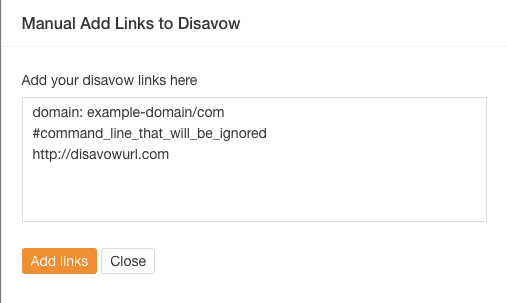 Once the disavow links have been added to the list, you can export the file to upload it to Google Search Console. 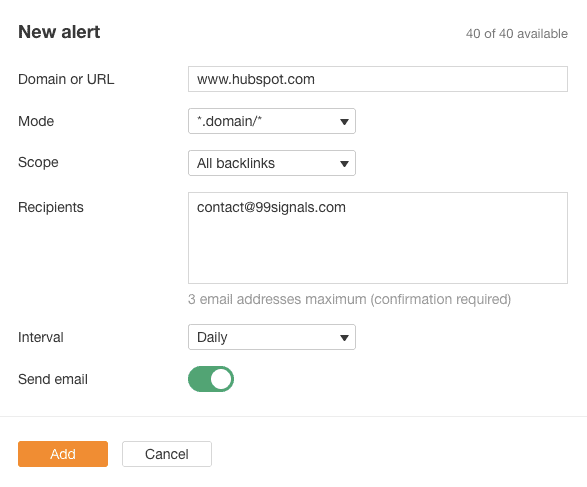 By setting up alerts for your domain or keywords, you ensure that you never miss another backlink or mention of your site. Ahrefs sends you an email every time you lose or gain a backlink and will also notify you when someone mentions your business or site. Click on ‘New Alert’ for each of these to activate Ahrefs Alerts. You can also spy on your competitors by setting up alerts for your competitors’ websites and businesses as well. Ahrefs lets you compare 5 domains side-by-side. 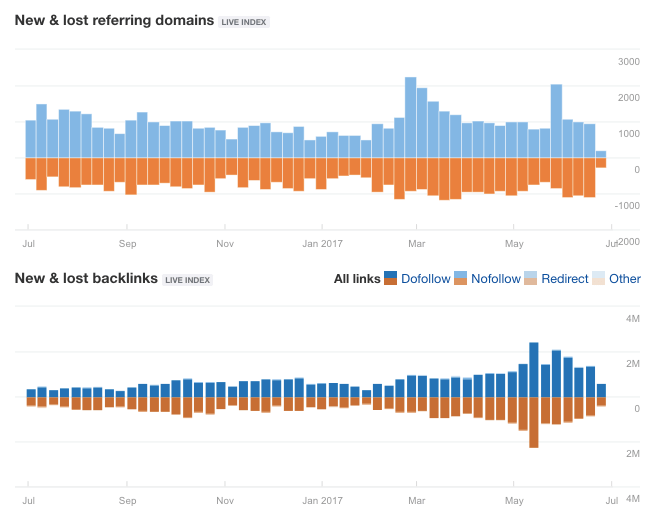 The results displayed include a comparison of referring domains and IPs, backlinks, backlink types (dofollow vs nofollow), and graphs of changes in each domain. In addition to analyzing backlinks, Ahrefs is also a powerful keyword research tool. Keywords Explorer (now called Keywords Explorer 2.0) can help you generate tons of keyword ideas with its database of over 3 billion keywords. Discover new keyword ideas – With the latest update, Ahrefs provides you with massive amounts of keyword ideas, including phrase match, having same terms, search suggestions, and more. “Clicks” metric – In addition to search volume for keywords, you also get to see clickstream data, allowing you to calculate search volumes more accurately. Keyword Lists – Once you come across some new keyword ideas, you can now save them into a list for future reference. A huge time saver if you’re doing keyword research for multiple projects. Keyword Difficulty Score – Ahrefs’ Keyword Difficulty (KD) score is an estimation of how hard it would be to rank on the 1st page of Google organic search for a given keyword. It is measured on a scale of 1 to 100 (low difficulty to high difficulty). SERP overview & Positions History — Ahrefs’ new SERP overview report brings all the core SEO metrics together to help you make educated decisions about the actual difficulty of a given SERP. 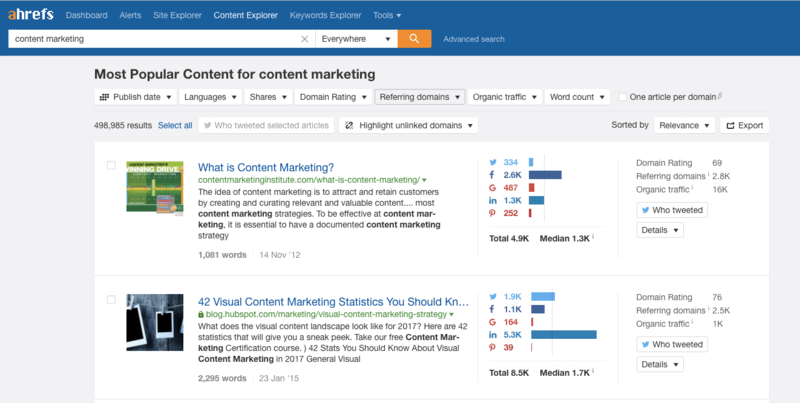 Content Explorer helps you find the most shared content for any topic. Type any topic into the search bar and Ahrefs will show you the most popular content for the topic with details on total social shares, domain rating, referring domains, and the organic traffic it generates. You can filter down the results by publish date, languages, number of shares, domain rating, referring domains, organic traffic, and word count. You can also find out who tweeted the articles by clicking on the ‘Who tweeted’ button. This data can be exported onto a CSV file which you can use late for outreach purposes. Ahrefs’ user interface is clean and organized. This makes the tool very easy to use, an impressive achievement considering the vast amount of data the tool provides. The team behind Ahrefs has worked really hard to create a platform that’s immensely user-friendly not just for beginners, but advanced users too who are migrating from other SEO platforms. Ahrefs provides customer support via phone, chat, and email. You can also search for questions at their help center to see if they’ve already been addressed by the team before. They don’t organize webinars like SEMrush does, but their blog is resourceful with tons of blog posts that you can check to sharpen your SEO skills. Ahrefs has garnered quite a reputation among professional bloggers and marketing pundits in the past few years. The tool is a part of most marketers’ must-have SEO tools and it’s easy to understand why that’s the case. Most reviews commend the accuracy of data obtained from Ahrefs and its backlink analysis feature while a few others complain about the steep monthly subscription price of the tool. Ahrefs does not have as many reviews as some of the other SEO tools such as Moz and SEMrush. It’s yet to get any review on Capterra, another popular online review site. This may be due to the fact that Ahrefs is a relatively new tool compared to Moz and SEMrush. 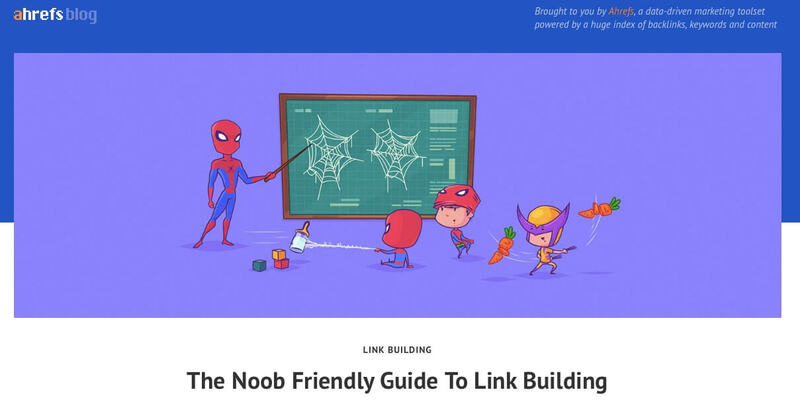 Ahrefs has built a brand around its backlink checker capability because of the sheer depth of its index, but once you start using the tool, you realize that it is much more than a backlink analysis tool. From Rank Tracker to Keywords Explorer, Ahrefs provides quality data that can be invaluable to your website. If you’re serious about SEO and content marketing, this is a must-have tool in your marketing toolkit. Ahrefs is the #1 backlink analysis tool, trusted by SEO experts worldwide. 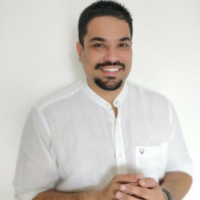 In the recent past, the company has also branched out to other areas such as keywords research and content marketing, making it a full-fledged SEO and content marketing tool. Thanks! Glad you found the review useful. I like ahrefs and majestic both. Ahrefs has grown better over time. Every day I use ahrefs and it is better than Moz.It has higher quality than alls. I think ahref is the best tools for checking backlinks. Hi Muhammad – I can’t help you with Ahrefs discount. As far as I know, they’re not offering any discounts currently. 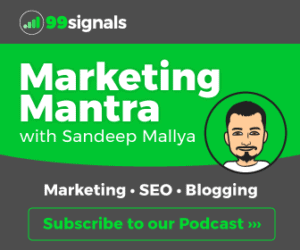 If you’re looking for a similar SEO software, I’d recommend SEMrush. I’m currently offering exclusive 14-day full-access free trials of SEMrush PRO ($49.97 value) & SEMrush Guru ($99 value). To learn more about SEMrush, check out my in-depth review of SEMrush here.